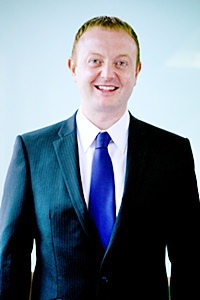 Paul Gambles MBMG International Ltd. In Thailand right now we are seeing a lot of focus on political risk. This is understandable in the run up to what may prove to be a landmark election. However, barring any really 'Black Swans' in either the period from now until July 3rd or the aftermath, the external risks are probably of greater concern to the Thai economy which probably ought to be paying equal attention to events in Athens and New York as well as in Isaan. In many ways, global economic risk is at even higher levels currently than Thai political worries and certainly likely to have a greater legacy on the Thai and global economies. 1) The typical net return for investors in 2006 (incentive to save), although the flat yield curve reveals future expectations of economic problems. 2) 2007 saw a slightly more normalised curve, but one which was still pretty flat and offered no premium for 30 year bonds - again indicative of nervousness about the economic outlook. 3) The negative yields which appeared in 2008 for all except long duration bonds created a disincentive to save, especially in the short term. The greater disincentive at the short end pushed investors up the risk spectrum, if they wanted to target the same net returns. 4) Even when the immediate crisis passed in 2009, the real incentive was at the longer end of the bond range - having been forced up the risk spectrum since the end of 2008, investors were given no encouragement to come back down again. 5) Last year real yields at the short end became negative again - what had been a very slight incentive to save the year before became a disincentive again. At the same time the incentives to buy long-dated bonds also fell. 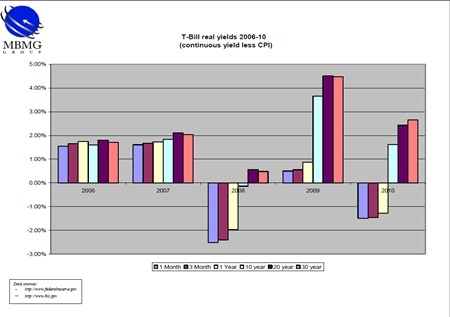 The effect of monetary policy, in the US but also in many other developed and developing economies, especially in the last two to three years, has been to push investors in 2 steps from risk-free investments (if, indeed, 30 day T-bills ever were) to longer dated bonds and then from longer dated bonds to riskier assets such as corporate bonds, property, developed and emerging equities and commodities - the assets which have been virtually forced to rally the most. This has also been reflected in currency markets where almost all major currencies are, to varying degrees, inverses of the Greenback - anti-Dollars as it were. The varying extents are largely dictated by the riskiness of the currency, with the highly volatile, carry-trade dominated AUD rising the most. However, this is almost certainly the wrong reaction - risk is what it is and what it has always been - the probability of a range of satisfactory outcomes as well as a range of unsatisfactory outcomes. The danger with abandoning your risk profile is that generally that risk profile fits because you cannot afford the downside if it goes wrong. When the tide goes out, any investors who have abandoned their risk/reward ration, and comfort area, will find themselves naked at the wrong end of the risk pool. The liquidity trap is like a Ponzi scheme, supported only by confidence and inflows. When it collapses it does so pretty instantly, not in installments. We will look at some other impacts of this and also the currency issues another time but for now, it is best to realize that this is a time for patience and forbearance - better to stay true to your risk profile and accept a lower real return than to chase return and throw your risk principles to the wind. It can be hard to do but the best professional advice right now should be tempering expectations of returns in the short term rather than getting investors to take on a higher risk than is comfortable. More than anything, please remember my old mantra, diversify and remain liquid. The International Monetary Fund (IMF) produces many reports every year for public consumption. One that was snuck away at the back of a report on Asia repeated previous claims that China will overtake the USA as the world’s leading economy. This is not news. However, what is new is that they gave a date for the first time. And it is only five years away - 2016. Assuming the IMF is correct in its forecast how will it affect the world economy? The most obvious thing that will be affected is the US Dollar. If China has the No. 1 economy, which country will have the world’s reserve currency - if there is one? Will a new global security system have to be created? Although this transfer of power was expected, many did not think it would happen until 2025 at least. However, there is a potential problem. They are comparing apples and pears. When you look at this in detail you can see they are measuring the Gross Domestic Product of the US and China using the present exchange rates. The dilemma is that exchange rates change from one moment to the next. On top of this there is the undeniable truth that Chinese rates are made to suit China’s policies at any one given time. The Renminbi is normally undervalued at the best of times due to massive intervention in the markets. This could cause the research to be questioned. However, the IMF also took into account the “Purchasing Power Parities” (PPP) of both countries. This compares what people actually earn in America and China and spend in their own economy. Now things start to get interesting. If you consider the PPP as the guide then it is forecast the Chinese economy will go from just over USD11 trillion this year to USD19 trillion in 2016. Over the same five year time span, the US will go from USD15 trillion to almost USD19 trillion. This translates into the America’s share of world output falling to 17.7% and China’s increasing to 18%. 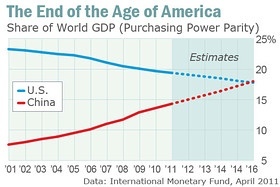 It was only ten years ago that America’s economy was three times that of China’s. As regular readers of this column know, I am a great believer in lies, damned lies and statistics. It will be fascinating to see how the IMF prediction works out. There are many pitfalls ahead and the unforeseen will doubtless happen. The forecast could well be out by many years but the end will come for the US. It happened before to Rome, Spain, France and England. In the 19th century Great Britain was the world’s economic leader. They passed the baton onto America in the early part of the 20th century and now it is the turn of the Chinese. Sometime in the future they will hand over to some other country. There is a difference though. Both Britain and America are democracies. China is not and the leaders do not have to answer to the population or the rest of the world. Whether countries round the world like it or not, China is planning for the future and stuff anyone else. They are buying up massive amounts of land in Africa and South America. They only worry about their own. Given all of this it makes it even more mystifying that the US tries to spend itself out of trouble and carries on printing money at a rate that even Robert Mugabe would be proud of. The situation cannot continue without something snapping. One of the main problems that people all over the world are worried about is the fact that the US Treasury still thinks it will always be in charge of the world’s reserve currency. People involved in the real world realize this is nothing more than fanciful thinking and is why they are buying such things as gold. These folk understand that the US Dollar will not rule the world forever. No-one knows what will replace it yet but it will be replaced by either gold, a basket of currencies or the Renminbi. So, China. What to do? Well, as we all know, good china increases in value but it can break easily. It certainly makes sense to have China as part of your portfolio but take care and make sure the funds or shares you have are liquid and can be sold quickly should there be a sudden market downturn. Forget Greece, an acrimonious dispute over the origins of the bacterial disease that has claimed 16 lives in Northern Europe has worsened the already fragile relationship between Germany and Spain. Cucumbers grown in greenhouses in southern Spain were initially identified by German officials as the source of a deadly strain of the E.coli bacteria, believed to be behind an out outbreak of severe illness in North Germany. The accusations, which were unproven and now appear unfounded according to the FT, have not only damaged the important Spanish and Dutch horticultural export industries but increased political strains! Spanish Ministers were incensed when Angela Merkel, the German Chancellor, suggested in a speech this month that people in countries such as Spain took too many holidays, did not work long enough hours and retired too early. The “cucumber crisis” has contributed to this sense of resentment as supermarkets have taken down signs insisting they have NO SPANISH PRODUCE or the Financial Times Deutschland wrote, “We are in a pickle” on Wednesday. Seriously though, the Political framework in Euroland is fragile at best. The peripheral countries of Greece, Ireland and Portugal are slow moving train wrecks and restructuring (default of some form) of their government debt, not band aid rescues, is required to remove uncertainty and allow all parties to be “equally unhappy”. As we have written many times in 2010, the debt to GDP ratios are getting worse with austerity and the sooner the default is handled the better it will be for investors in the long run. The other more serious issue from the “cucumber crisis” is the increasing potential serious outbreak of a food disease epidemic. The American Novelist Barbara Kingsolver has recently written a book entitled, “Animal, Vegetable, Miracle” which is a true story about her family’s endeavour to eat only locally produced food for 12 months. One of the startling facts in the book for me is the risks involved in the genetic modification of seeds, to ensure foods can travel around the world for consumption, notwithstanding the effects on the oil price. In a meeting with the Sarasin AgriSar fund manager last week he showed us the following chart which highlights how a Wheat Rust disease that started in Uganda has spread, with the lighter shaded areas now high to medium risk (see photo this page). Food has evolved over thousands of years to adapt to certain circumstances; the genetic modification of this process may also be putting a band aid over a long term problem for short term gain. The “cucumber crisis” may not help the Europeans create a central finance ministry as proposed by Jean-Claude Trichet recently but will help the price of organic produce within his zone. Spread of Wheat Rust threatens over 25% of global wheat production. Recently gold went through the roof and then fell off it. What to do? Is this a blip or has gold now reached its peak? What happened was down to many reasons but the basic ones are: profit taking, increased margin requirements and a ridiculous amount of speculation in the market. However, the price crash does not change the fundamentals of the economy. The fact is there is too much paper money being printed and inserted into the money supply. This means that no matter what short term speculation happens - the fundamentals in the economy behind these metals will never change. 1. When gold got to over USD1,400, Credit Suisse said there was nothing to worry about as this was only a Standard Deviation (SD) of 0.7 from when it was under USD1,000. This is nothing when you consider the average SD in recent bubbles - Japanese equities in the mid-1980s, dot.com in the late 1990’s and Goldman Sachs Commodity Index in 2005 - was 5.3. When gold shot up in 1979, the SD was over 10 which is much more than where we are at the moment. See Graph 1. 2. People who own gold are not just those evil speculators. Eric Sprott of the Canadian company, Sprott Asset Management, actually shows that gold is still under-sold. Although there was a 30% rise in gold holding during 2010 when compared to a percentage of worldwide financial assets, this has only gone up by less than 0.75% and this is only really due to the fact of how much gold has gone up, not by the rise in actual investment. Sprott has calculated that the actual new investment into gold bullion over the last decade or so is about USD250 billion. This is nothing when compared to nearly USD100 trillion that has been invested in other financial assets since 2000. 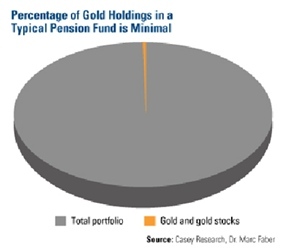 Going hand in hand with this is that institutional investments, especially things like pension funds, in gold are still comparatively small. See Graph 2. 3. If the US Dollar reduces in value this should only be good for gold as it will mean a higher price. Despite recent volatility gold should continue on its upward climb for the foreseeable future. The trade weighted dollar index (DXY) is only just more than the lows seen towards the end of 2009 and is only 8% more than the nadir of March 2008. Gold will always benefit when there is a problem between a country’s fiscal and monetary policy. This is what is happening at the moment in the US and elsewhere and gold is the benefactor. 4. It is the normally the way that when there is a rise in deficit spending, printing presses going 24/7 and low interest rates, the rate of inflation will be higher than the nominal rate. Gold always benefits when this happens. 5. When put together, the economies of Eurozone, Great Britain and the US have a combined USD6.3 trillion of excess leverage. This means that each of their central banks will have to keep real interest rates at extremely low levels. 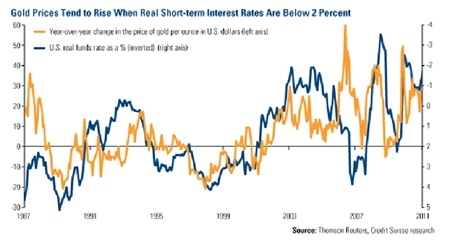 This makes things good for gold - as seen from Graph 3. 6. So far we have just been blaming the west. However, it must be remembered that as the wealth of eastern nations increases then so does the attraction of gold to the people in those countries. The more gold they buy the more demand there is and so up goes the price. 7. Lots of people talk about the G7 but we should also consider the E7 which comprises the top seven countries with the most people. What is noticeable is that the G7 is responsible for half of the global GDP but only has 10% of the world’s population. However, the E7 make up half the world’s population but only contributes 18% of GDP. Why is this significant? Well, money supply and GDP per capita is rising much faster in the E7 than it is in the G7. In fact it is almost eighteen percent against 3.7%. If the money supply growth is generally more than fifteen percent it usually bodes well for gold. 8. As things stand at the moment, the US deficit looks to be around USD1.5 trillion. 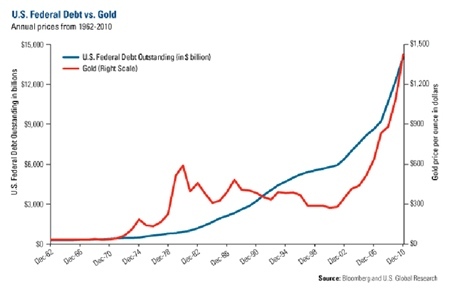 Graph 4 shows how this affects the price of gold when compared to US debt. So, the future for gold looks nice and rosy but for how long? Credit Suisse believe gold will be at USD1,550 by the end of the year whereas BCA thinks it could be as high as USD1,600. 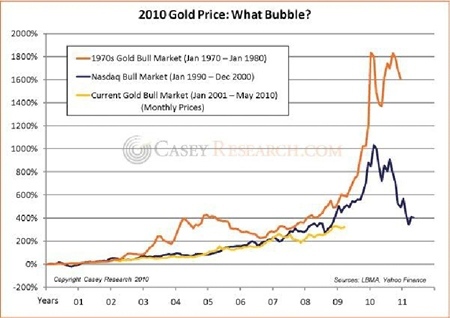 There is no doubt the current gold bull market will end. Indeed, George Soros recently sold all of his gold but many people believe this is too early. There is too much volatility in other asset classes at the moment for gold not to be important and so it should still be part of your portfolio but make sure you can get rid of it quick if necessary.